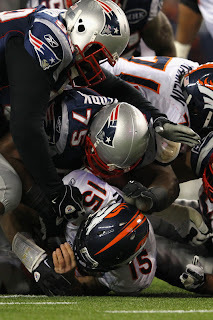 In retrospect, nobody should be at all surprised by the result of the Patriots/Broncos game yesterday. It's very easy to explain really: Denver wasn't actually any good this year. They were an 8-8 team that got outscored by 81 points on the season, and made the playoffs through an obscure technicality in a 3-way tiebreaker. And SEVEN of those eight wins we're of the fluke/lucky/ coincidence variety (they won 6 games by 4 points or less, and one by a touchdown in which their quarterback had only 2 completions). The Broncos were a team that could have been 1-15, probably should have been 5-11 or 6-10, and we're led by a guy who had easily some of the worst numbers of any NFL quarterback. Denver's offense was so bad that the much maligned New England defense allowed a season low 252 yards yesterday (including a league-wide season high 14 plays for negative yardage). And as I've said before, post season numbers don't count towards a player's career statistics; but #15's dismal 9 for 26 performance yesterday would have sent the Tebometer plummeting. - New England ran 64 plays total, but had only 6 third downs in the entire game. - Part of the reason for this is that they had a whopping 509 yards of offense, an average of 7.95 yards per play. - By comparison the Broncos had 252 yards on 72 plays, an average of just 3.5 yards. - All of this helps to explain how the Patriots absolutely dominated the game, despite trailing in "time of possession" 33:23 to 26:37. That is something you rarely see. Also, in case you didn't notice, I paid careful attention not to actually mention a certain player's name in this blog. I'm hoping I never have to again.